If you regularly use two or more PCs then you'll know that sometimes it's necessary to transfer files between them. Occasionally this is easy, and you'll just need to copy some documents from your laptop to your PC, for instance. But often it's much more complicated, requiring you to transfer files in both directions to get each system up-to-date, a time-consuming business that's easy to get wrong. Life could be much easier if you automated these tasks, then, and Laplink PCsync 6 is one of the most capable file transfer and synchronisation tools around. 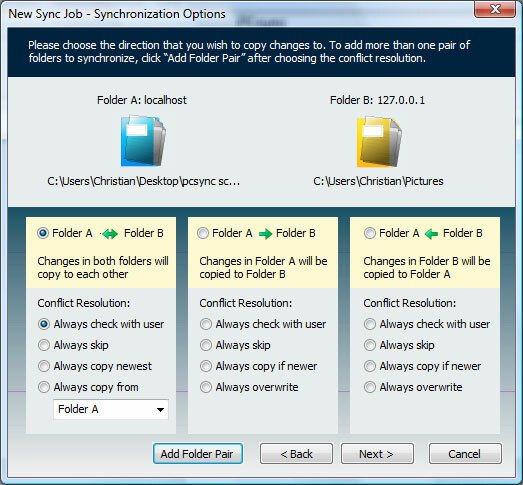 In a few clicks you can set up the folders you want to synchronise, the direction (copy from laptop to PC, for example, PC to laptop, or copy changes in both folders to each other), and the file types you'd like to be copied. You can also choose to run the synchronisation manually, or set up a schedule to run it when you're not around. You'll still need to connect your two systems, of course, but there are plenty of options on offer. PCsync 6 will work across an existing network connection, wired or wireless, or you can directly your systems using special Laplink Ethernet or USB cables, or the Windows Easy Transfer cables from third-party manufacturers like Belkin. Performance is likely to be excellent, no matter how you get connected, thanks to Laplink's SpeedSync technology: it ensures that only the changed portion of files are transferred. And this extra speed means PCsync 6 doubles well as a backup program, quickly mirroring files to external hard drives or across your network for safe keeping. New Mac compatibility means you can now even synchronise files between Windows and Apple Macintosh PCs. And if you've decided to abandon the Windows world, the Mac Migration Wizard now makes it easy to move all the most important files and folders from your PC.